Bistek Tagalog is a type of Filipino beef stew. This is also known as Beefsteak to some people. It is comprised of thin slices of beef and a generous amount of onions. These are stewed in a soy sauce and lemon juice mixture until the beef gets very tender. It is best enjoyed with warm rice. In my opinion, there is a huge possibility that the term Bistek was derived from the words “beef steak”. I have not done the research yet. It is appreciated if you can provide facts about the history of this beloved Filipino dish. Don’t be shy. The comments section is located below this recipe post. This recipe does not require much ingredients and the procedure is simple. Beginners will enjoy learning how to cook bistek. I’m sure that you will also like how it tastes. Talking about taste, I enjoy pouring the sauce over warm rice. It makes it tastier and more enjoyable to eat. The process requires the beef to be marinated in soy sauce and calamansi juice. This step helps infuse flavors to the meat. I use dark soy sauce for this recipe. You should be able to use light soy sauce without issues. Calamansi or calamondin is best use for this dish. However, lemon or lime can be used as alternative ingredients. Simply combine soy sauce, calamansi juice, and ground black pepper in a bowl. Add beef slices. Marinate for 1 hour. It will be better if you can place everything in a resealable ziplock bag and let all the air out before sealing. The minimum marinate time is one hour, but doing it overnight is ideal. The next step is to pan fry the marinated beef slices and onions. Make sure to drain the remaining marinade before frying the beef. Save the marinade. We will use it later. I usually pan fry half of the onions first before the beef. You just need to fry the onions until it starts to get soft. Take it out of the pan immediately and set aside. This will be added as the topping for the dish. Pan-fry the beef for 1 minute per side. Take it out of the pan afterwards. Add extra oil if needed. Saute garlic and remaining onion. The onion needs to be soft and the garlic should be light brown before you pour the remaining beef marinade. Add water and let the mixture boil. Put the pan-fried beef into the pan. The beef needs to be tenderized. Cover the pan and simmer until the beef becomes really tender. This is where good quality meat and cuts stand out. It is important to use the freshest beef and select tender cuts such as sirloin and top round. Do not forget to add water if the liquid starts to dry out. You can season it with more ground black pepper and salt if needed. Top the dish with pan-fried onions before serving. Try this Bistek Tagalog Recipe and let me know what you think. 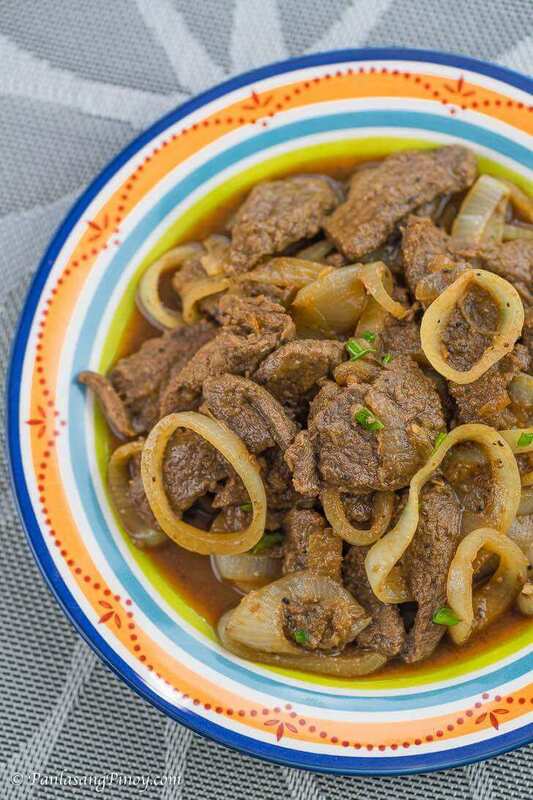 Beef slices cooked in soy sauce with lemon and onions. This is bistek tagalog. Add more oil if needed. Saute garlic and remaining raw onions until onion softens. Pour the remaining marinade and water. Bring to a boil. Add beef. Cover the pan and simmer until meat is tender. Note: Add water as needed. Season with ground black pepper and salt as needed. Top with pan-fried onions. Transfer to a serving plate. Serve hot. Share and Enjoy! Very good recipe! Ang sarap! Salamat. I have made this twice and my family loves it. Your recipe is better than my friends and she is Filipino. Salamat kaayo ha. Perte kalami! Ang sarap… My son loves it. He knows how to prepare this na. Godbless you.